FILE - A police officer stands outside an Italian restaurant in Salisbury, England, March 6, 2018, near the spot where former Russian double agent Sergei Skripal and his daughter were found critically ill March 4 following exposure to an "unknown substance," later reported to be a nerve agent. British soldiers have been deployed to the normally quiet town of Salisbury to help officials decontaminate the area after a Russian former double agent and his daughter were poisoned with a nerve agent. About 180 troops have been sent to the southwestern English town to remove vehicles involved in the incident as well as objects that could have been contaminated. Forensic experts in bright yellow hazardous-materials suits have cordoned off the home of Sergei Skripal, who along with his daughter, Yulia, 33, were found unconscious Sunday on a bench outside a shopping mall. Both were in critical condition in a local hospital, poisoned with what authorities said was a rare nerve agent. Officials have also cordoned off an Italian restaurant and a pub Skripal and his daughter visited before their collapse, as well as a cemetery where Skripal's wife, Lyudmila, is buried and where there is also a memorial headstone for his son, Alexander. Lyudmila died in 2012 of cancer, while Alexander was cremated last year after reportedly dying of liver problems at age 43. Detectives are retracing the Skripals' movements as they try to discover how and where the toxin was administered. Officials said 21 people in Salisbury had received medical treatment as a result of the nerve agent, including a police officer who was in serious condition. Police have not publicly talked about the nerve agent that poisoned Skripal or who might have been responsible. But suspicions are pointing to Russia. 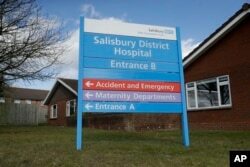 A entrance sign stands outside Salisbury District Hospital where former Russian double agent Sergei Skripal and his daughter, Yulia, were taken after being found critically ill March 4, 2018, in Salisbury, England. British Defense Secretary Gavin Williamson said Britain was being "pushed around" by the Kremlin. Prime Minister Theresa May has promised an "appropriate" response if it is discovered that Russia is responsible for poisoning Skripal, but has urged caution. "Let's give the police the time and space to actually conduct their investigation," May told ITV news Thursday. Russian officials deny the Kremlin had anything to do with the assassination attempt. Skripal served in Russia's military intelligence agency, GRU, and was exchanged in a spy swap in 2010 on the runway at Vienna's airport. After serving four years in prison in Russia for spying for Britain's espionage service, MI6, Skripal was one of four Russian double agents exchanged for 10 Russians expelled from the United States, including Manhattan socialite Anna Chapman. The incident is drawing comparisons to the case of Alexander Litvinenko, a Russian KGB officer-turned-British intelligence agent and a highly public critic of President Vladimir Putin. Litvinenko died an agonizing death days after drinking tea laced with radioactive polonium-210 in a London hotel in 2006. British doctors struggled in that case to identify the substance that killed him. A British inquiry concluded Putin probably approved the killing. The conclusion was angrily dismissed by the Kremlin as a politically motivated smear.